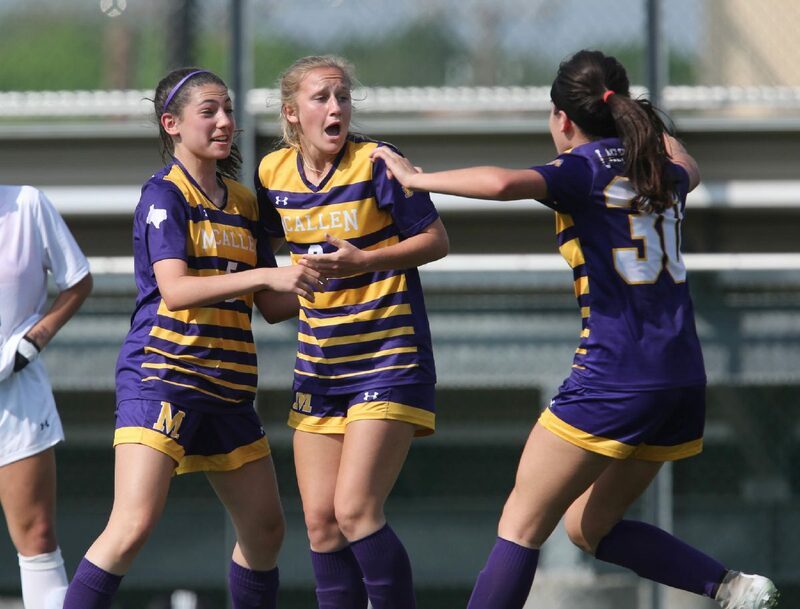 McALLEN — On the goal that sent McAllen High to the state tournament, Westyn Henderson lobbed a soaring pass to Ava Alaniz, who dribbled in and finished low to lift the Bulldogs to soccer’s final weekend. Henderson, who was elusive and difficult to defend at regionals, and Alaniz, a central midfielder who didn’t seem fazed by the strength of San Antonio Johnson or Austin Lake Travis, are both in their second year of high school. Youth is a trend for McHi, as the team has nine sophomores on the varsity roster and will lose only five players to graduation. Freshmen outnumber juniors six to four. McAllen High's Westyn Henderson heads the ball as San Antonio Johnson's Ashley Stamps defends during the first half of their Class 6A regional semi-final match Friday, April 13, 2018, at Blossom Athletic Center in San Antonio. McAllen High won the match 2-1. The young Bulldogs are set to compete in the Class 6A state semifinals against Houston Memorial at 9:30 a.m. Friday, and Andrea Soto said that her sophomore class is setting the foundation for McHi to continue to be a top team for years. Andrea Soto and her triplet sisters Sophia and Giselle make up one-third of the Bulldogs’ sophomore core. Goalkeeper Lexi Gonzalez, midfielder Rachel Torres, Sarahi Acosta and forward Mireya Ramirez, a key midseason addition to varsity, are the remaining sophomores. 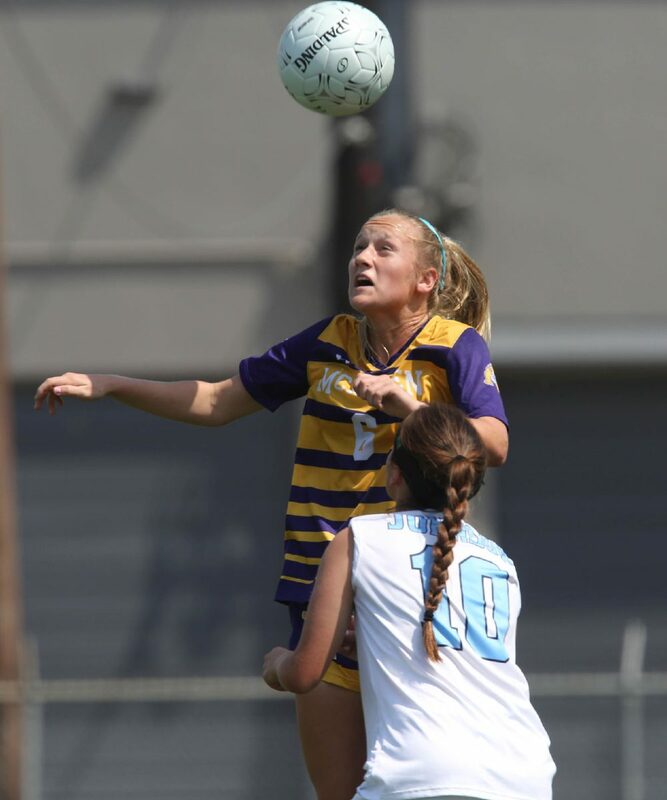 Andrea Soto said building chemistry was easy because most of the 2020 class had played on the pitch together before putting on purple and gold. She said they had already been exposed to high levels of skill. That experience, plus the sour taste left from last season’s 3-0 loss to Austin Vandegrift in the regional semifinals, helped prepare McHi for this year’s playoff run. Junior defender Emily Gurwitz said watching the 2020 class make an impact has been exciting. Bulldogs coach Pat Arney said he’s learned through his 22 years coaching at the school that a special team needs a special class to grow together and carry the load. Arney said another coach within the school district remarked how impressed he was to see so many 10th-graders contributing at the varsity level. Arney knows that club soccer participation helps, but even his team has plenty of room for growth.